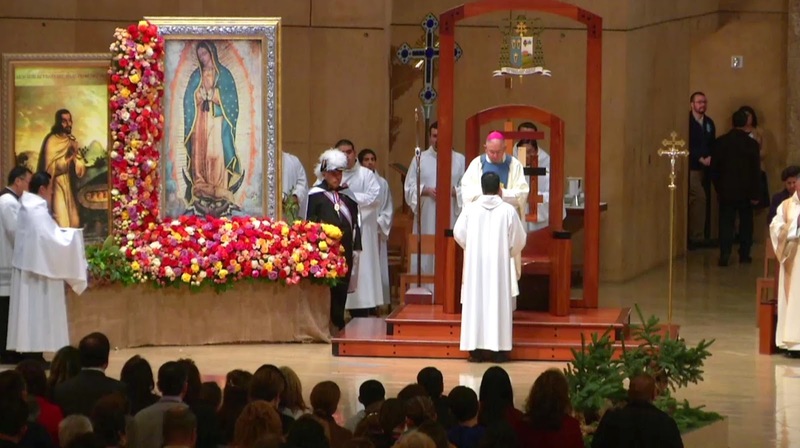 For those in need of subtitles, the above is Archbishop Blase Cupich's homily at Midnight Mass for this feast at Chicagoland's Guadalupe Shrine at Des Plaines. 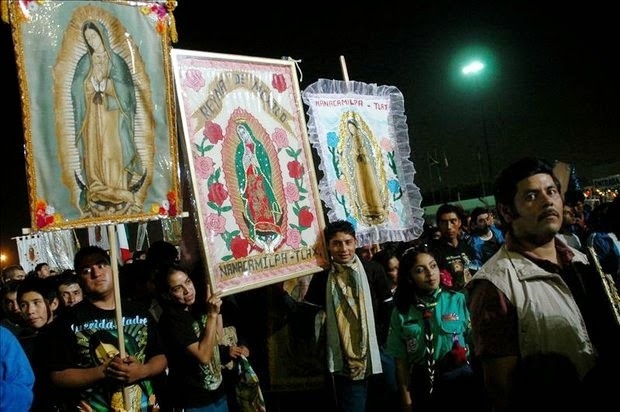 With a throng of up to 150,000 expected for the 36-hour celebrations in sub-freezing temperatures, the Des Plaines feast is, by far, the biggest annual event in today's Stateside Church – the signal moment marking the ascendancy of a Hispanic flock in the nation's third-largest diocese that now comprises the de facto majority of Chicago's 2.3 million Catholics, to say nothing of the similar epochal shift taking place from coast to coast. Despite the size and prominence of the mega-gathering, however, tonight's Blase-Mass marked the first time the midnight hour there has ever been led by the city's archbishop... who, in an astonishing allegory of his ascent to Chicago, got to look out on a crowd bigger than the entire diocese he led until last month. Its observance televised nationally over Univisión, much as today's feast is the the two-decade old Des Plaines shrine's high watermark of pilgrims, the site's average weekend crowd of some 10,000 for Sunday Masses have led to plans for the construction of a $60 million, 5,000-seat church that would rank among the US' largest worship sites. With LA's Cathedral of Our Lady of the Angels – seat of the largest diocese in American Catholicism's four-century history, now a 5 million-member (70 percent Latino) juggernaut – rocking through the night (above), a first-ever morning procession from Central Park to St Patrick's Cathedral will shut down Fifth Avenue before Cardinal Timothy Dolan celebrates a 10am Mass in the nation's second-largest outpost, now likewise in the range of a Latin plurality among its 2.5 million faithful. And of course, the global celebrations will be capped with a particularly historic moment: in his first public Mass in Spanish since his election as the first Bishop of Rome from the Americas, the Pope will lead a feast-day liturgy in St Peter's at 6pm Rome time, specially timed to be seen on this continent in the middle of the day. Having conferred his lone Golden Rose to date on the Empress of the Americas, the Mass will additionally mark the 50th anniversary of the Misa Criolla – the post-Conciliar suite (arguably the most famous vernacular Mass setting in Spanish) by the Argentine composer Ariel Ramirez, which has long been a favorite piece of Papa Bergoglio's. Joined by an orchestra from the Pope's homeland, Ramirez's son will conduct the piece's portions during the Eucharist. As crowds in excess of seven million – a mass of humanity larger than Islam's annual Hajj to Mecca – have converged at the Guadalupe Basilica itself this week, it is notable that Mexico City's Cardinal Norberto Rivera is instead in Rome for the papal liturgy, fueling speculation that Francis could use the Mass to announce a long-expected 2015 trip to Mexico, a leg likely to immediately precede late September's US trip... and one which might just include a Pope-stop at the Border. All that said, the most important thing today is far from news... porque como el himno de esta solemnidad dice, "hoy es una dia de fiesta con ganas de celebrar, desde el Tepeyac por [todo] el mundo." Que celebremos con alegría la bondad de Dios en el regalo de su Madre como Madre nuestra – este dia quando la Reina del Cielo se convierte la Emperatriz morena de toda la una America. ¡Virgencita de Guadalupe, ruega por nosotros!